This plot-heavy sequel to the 2015 Marvel superhero hit feels overstuffed with ever so many story elements. Rating: 2 stars out of 4. Let’s get small. Let’s get really, really small. Like subatomic teeny. Now let’s get BIG. BIG like huge. Ginormous. Like baby Godzilla. Now suddenly, back to small. And, just as speedily, to BIG. A very busy Marvel movie is this sequel to the 2015 superhero hit in which Rudd played the role of Scott Lang, aka, see title. 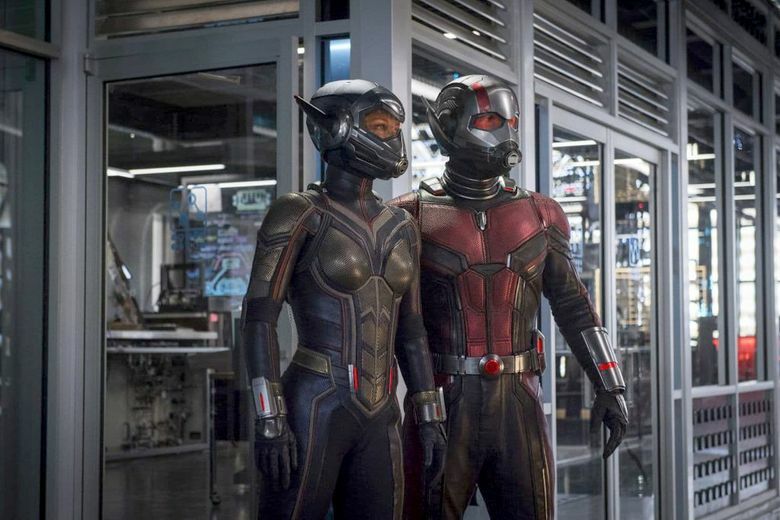 Pretty much everyone from the original is back for the follow-up: Michael Douglas as Scott’s peevish mentor, inventor Hank Pym; Evangeline Lilly as Hank’s daughter and Scott’s sometime sweetie, Hope van Dyne; oh, and she’s also the Wasp; and Michael Peña as Scott’s one-time cellmate, Luis, among others. A corporate thief (Walton Goggins) is lurking around trying to steal Hank’s technology for evil purposes. And a character called the Ghost (Hannah John-Kamen), an escapee from the Quantum Realm, is an anguished creature who dematerializes and rematerializes at will during fights with Ant-Man and the Wasp, making her a tough opponent to beat and defeat. Got all that? Well, baked in also are an assortment of family-values elements. Scott, a one-time thief but basically a decent guy, wants to reform his life so he can be a more present and caring dad to his 10-year-old daughter, Cassie (Abby Ryder Fortson). Hank and daughter Hope have a fraught relationship owing to Hank’s concealment of the facts surrounding the disappearance of Hope’s mother. And the Ghost has father issues as well, principally pertaining to feelings of abandonment, which a surrogate father figure (Laurence Fishburne) hopes to heal. There’s a lot going on here, which leads to a whole lot of gassy exposition to explain it all, including two separate scenes in which two different groups of good guys are tied to chairs while villains bloviate on the intricacies of the plot. Think of it as torture by blah-blah. There are flashes of humor as well, many coming courtesy of Peña’s motormouthy character. Meanwhile, the special effects are coming at the audience thick and fast with Scott as Ant-Man and Hope as the Wasp speedily shrinking and growing, bopping villains, zooming around in dramatically downsized vehicles and battling with the baddies over possession of the big office building housing Hank’s tunnel to the subatomic world. That building itself is shrink-zapped and fought over at various points. The picture ends with a jolting tieback to “Avengers: Infinity War.” Sure didn’t see that one coming, but it certainly sets the stage for the inevitable sequel. ★★ “Ant-Man and the Wasp,” with Paul Rudd, Evangeline Lilly, Michael Douglas, Michael Peña, Hannah John-Kamen, Laurence Fishburne, Abby Ryder Fortson. Directed by Peyton Reed, from a screenplay by Chris McKenna, Erik Sommers, Rudd, Andrew Barrer and Gabriel Ferrari. 125 minutes. Rated PG-13 for some sci-fi action violence. Opens July 6 at multiple theaters.